Is it our instinct to attack, or are we conditioned to think that? Would we surrender in order to survive? Gridlock is an exploration of why and how people fight. 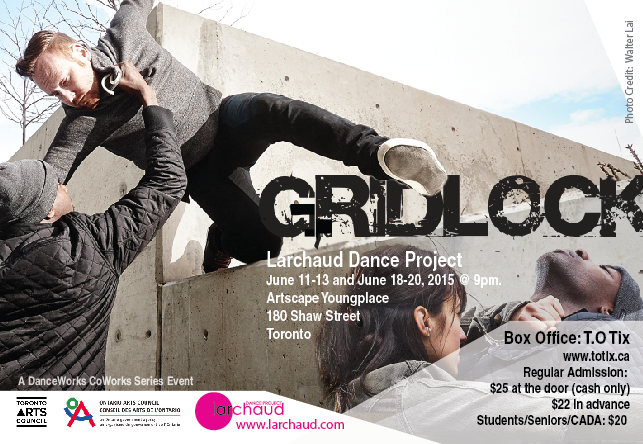 Physically electric, intelligent, and relevant – this is a must-see Larchaud production! Please Note: This is a site-specific performance that will travel throughout the building. Box Office will be inside the main entrance to the building. This production was generously supported by Toronto Arts Council and Ontario Arts Council.